QUALITY COVERS FROM OUTDOOR COVER WAREHOUSE, AMERICA'S LEADING COVER EXPERTS. Outdoor Cover Warehouse has one of the largest selections of outdoor covers. We offer covers for everything from cars, car seats, boats, golf carts, RV’s and patio furniture. Outdoor covers offer the best protection against harsh temperatures and external debris that could ruin your patio furniture, cars, motorcycles, golf carts and other vehicles. Besides protecting your outdoor furniture and vehicles, outdoor covers will also help extend the life of your outdoor furniture and vehicles. Outdoor Cover Warehouse provides high quality covers with a wide range of UV-resistant fabrics for outdoor use. We offer water-resistant and waterproof covers in a variety of colors and styles for year-round protection. Outdoor Cover Warehouse offers both affordable custom and semi-custom car covers to protect your vehicle from any hazard that could harm it. We have more cover options than anyone else including heavy-duty waterproof covers to protect your vehicle from the most intense weather, to lightweight covers designed to keep your car unblemished while parked in a crowded garage. One of the best ways to protect your car’s exterior is with a custom car cover. 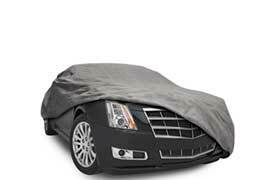 Car covers are inexpensive and portable. We offer an excellent line of weatherproof outdoor car covers that hold up well in any type of environment. Our covers are custom made to fit your car’s specifications perfectly. We also provide car covers with multiple layers of advanced protection to ensure your car’s investment is guaranteed to be safe from sun, weather, natural and even physical damage. We offer a wide variety of styles and performance levels for all types of vehicles including cars, trucks, SUVs and vans. All of our car covers are built to demanding quality specifications. Our covers are designed and manufactured to perform season after season for years to come. Innovative features, quality fabric and best fit are all found in every one of our products. Car seat covers help protect seats from daily abuse – kids, pets, dirt, spills and more…a good quality seat cover can help keep your car seats looking like new for years. Outdoor Cover Warehouse offers car seat covers in a wide variety of styles, colors and fabrics. Covers are available for a mix of car seat configurations including, front, rear and vehicles with third row seating. Seat covers are the perfect way to protect a new vehicle from the wear and tear a car interior can face. Whether it’s fading from UV rays or food spills from young kids, having custom fit seat covers can protect your seats and preserve the value of your vehicle. Seat covers are also a great way to bring a worn out seat back to life and make a vehicle feel like new. 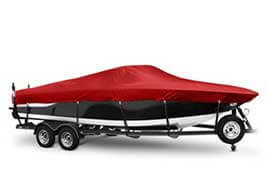 Outdoor Cover Warehouse is the leading provider of quality boat covers. The secret to our success is selling a great product and backing it with outstanding customer service from our friendly and knowledgeable staff. We specialize in getting you the right boat cover for your needs. We do this by offering a wide variety of covers made from the most durable marine grade materials including Marinex and Sunbrella. Outdoor Cover Warehouse carries industry leading cover brands such as WindStorm, WindStorm Elite, Wake, Trident and Ding. Buying a boat is a major investment. Many boat owners fail to realize the importance of properly protecting their boats when not in use. Exposure to rain, sun, wind, leaves, snow and dirt can seriously damage the exterior and interior of your boat, often resulting in mold growth and washed-out upholstery.A boat cover is an inexpensive necessity for all boat owners. Few things are better than being able to enjoy the outdoors from the comfort of your backyard or patio. However, watching your outdoor patio furniture be ruined by harsh sunlight, thunderstorms, wind, dust, and dirt can be heartbreaking. At Outdoor Cover Warehouse, we are dedicated to providing you with high-quality patio furniture covers at affordable prices to lengthen the life of your outdoor furniture and keep your time outside fun, safe, and enjoyable. If you’ve made a significant investment in patio furniture and you want to keep it looking great. Just one season will tell you that standard vinyl covers just don’t get the job done. You need waterproof furniture covers with heavy-duty fabric and top-quality stitching to keep you ready for your next barbecue. 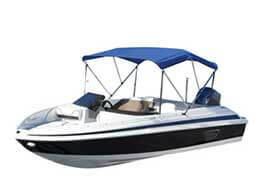 Outdoor Cover Warehouse specializes in getting you the right boat Bimini Top for your needs. We have a wide range of Bimini frame sizes and styles including 2 bow, 3 bow and 4 bow frame sets with matching Bimini canvas. We offer a wide variety of Bimini canvas kits and replacement canvas made from the most durable marine grade materials including Marinex and Sunbrella. Outdoor Cover Warehouse carries industry leading cover brands such as Summerset and Summerset Elite. Outdoor Cover Warehouse is the leader in quality Bimini Tops! From Biminis for fishing boats and pleasure boats to Biminis for pontoon boats and ski tower boats, we carefully select the products we sell to ensure that each and every Bimini top we carry will exceed your expectation. Shop 4 Bow Bimini Tops? Outdoor Cover Warehouse Covers are built to demanding quality specifications. You can always rest assured that our RV and trailer covers will protect your investment from the harshest elements nature can dish out. Every one of our covers are designed and manufactured to perform season after season for years to come, protecting your RV or trailer from harsh UV rays, rain, snow and ice. Innovative features, quality fabric and best fit are all found in every one of our RV cover products. 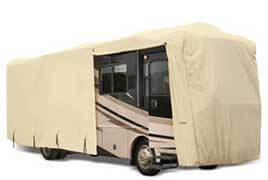 We specialize in getting you the right RV covers for your needs. We do this by offering a wide variety of covers made from the most durable fabric materials including Durapel and Tru-Weave. Outdoor Cover Warehouse carries industry leading cover brands such as Goldline, S2 Expedition, Expeditionand Traveler. Properly storing your RV during the winter or off-season months is critical, especially if your RV will be stored outside. An RV cover is the most cost effective way to ensure that your mobile home stays in the best possible shape, so it will be ready to use the next time you want to take a road trip. Our RV covers offer superior, long lasting weather protectionand backed by manufacturer warranties, so you can be sure you RV will remain protected year after year. 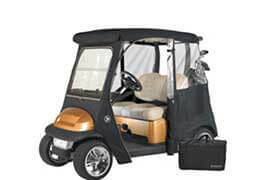 Outdoor Cover Warehouse Golf Cart Covers and Enclosures are built to demanding quality specifications. You can always rest assured that our golf cart covers will protect your investment from the harshest elements nature can dish out. Every cover is designed and manufactured to perform season after season for years to come, protecting your golf cart from harsh UV rays, rain, snow or ice. Innovative features, quality fabrics and best fit are all found in every one of our products. We always have the right cover or enclosure for your needs if you have an EZ-GO, Club Car, Yamaha, Western or any another cart brand. When it comes to golf cart enclosures, Outdoor Cover Warehouse has a wide variety of options for you to choose from. From the top of the line Sunbrella enclosures, to custom fit enclosures for major brands, we've got an option to fit any enthusiast needs. Outdoor Cover Warehouse Forklift Covers and enclosures protect operators against poor weather conditions, like rain, snow and wind. Our forklift covers attach in seconds to any forklift. 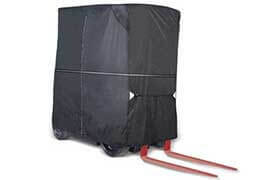 The forklift cover has zippered doors that can be shut or unzipped opened and folded back into place while working. Perfect for those rainy, windy days so you can still work warm and dry! The forklift enclosure is fantastic and it fits every lift on the market. Custom made of super clear material that wraps around the forklift cab, offering great protection, while protecting the operator from the elements and maintaining outstanding visibility. This is a must item for any warehouse or yard where weather is a factor. Outdoor Cover Warehouse Forklift Covers are built to demanding quality specifications. Whether you are trying to protect your equipment or your operators, we have the right solution for the job. Our covers provide year round protection from the harshest elements that nature can dish out. We specialize in getting you the right forklift cover for your needs. We do this by offering a wide variety of covers made from the most durable materials. Outdoor Cover Warehouse carries industry leading cover brands such as Atrium, Solarcap, Forkshield, and Fork-Stor. We proudly feature covers from cover industry leader Eevelle. Eevelle makes outdoor cover products for nearly every category. Below is a list of brands Eevelle manufacturers for each cover category. RV Covers - for Class A, Class B, Class C, Travel Trailers, Toy Haulers, Fifth Wheels, Truck Campers, Pop ups, and even Horse Trailers. Car Covers - Car covers, Truck covers, SUV covers, covers for all types of vehicles. Even car seat covers. Boat Covers - for Vhull Runabout, Bass Boat, Vhull Fishing Boat, T-top Boats, Pontoon Boats, PWCs, Center Consoles and all other popular boat styles. Bimini Tops - for all styles of boats including Pontoon boat biminis and ski tower biminis. Golf Cart Covers & Enclosures - for 2, 4 and 6 passenger carts, also special products for EZGO, ClubCar, and Yamaha. 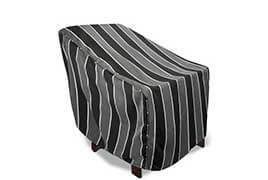 Patio Furniture Covers - for all types of outdoor seating, lounges, tables, BBQs. Also a selection of patio curtains and outdoor cushion slipcovers.